Epson EMP-TWD1 home cinema center : Listening, viewing, enjoying. 3:0 for Epson's new projector. Elegant design, ease of use and highest convenience. Just one device is sufficient for the extraordinary cinema experience. The latest device of Epson's home cinema range combines DVD player, surround system and projector. 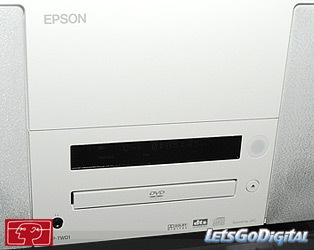 This device provides a crystal clear image of the 5th Epson 3LCD-technology generation. The DVD player and the JVC sound system compliment the combined device. For an home cinema experience just plug in the power cable, insert the DVD and press start - and films, sport events and concerts are displayed at home. The benefit: A large room is not required. A 1.20m wide image can be generated at a distance of just 1.50m. Home projector - Super presentation : The Epson EMP-TWD1 home cinema projector features a lens shift function ensuring a perfect image even when the projector is positioned off-centre. No image distortion thanks to horizontal image and vertical image shift control. The integrated cinema filters for excellent presentation of colour and mono values top off the home cinema feeling. It only takes one step to experience the world of home cinema. The EMP-TWD1 can also be used as a surround hi-fi system when not viewing a film. The small Epson device can also be integrated in large systems and can be connected to an external tuner and game console, video recorder or S video. Home cinema projector - All in one : Furthermore, it can also be used as a "slide projector" for viewing holiday snaps from the CD directly. 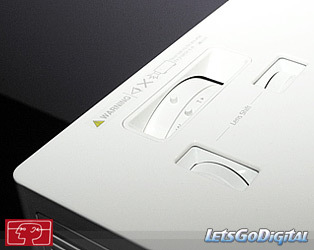 Thus, it becomes the core device of the home entertainment system for experience at home or with friends and family. The home cinema expert weighs only 7 kg enabling easy transport. Easy and rapid installation and dismantling. 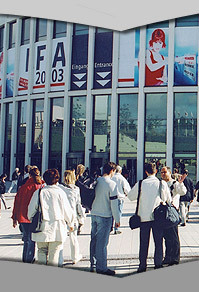 With this device you are well-equipped for the football Worldcup 2006. Experience the games live and feel the fascination! The Epson EMP-TWD1 can be connected directly with a DVB-T (Digital Video Broadcasting-Terrestrial) or a satellite receiver. 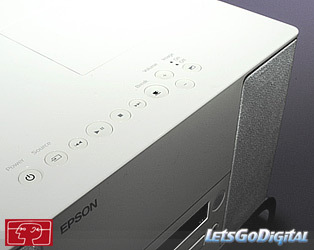 Epson EMP-TWD1 - all-in-one! 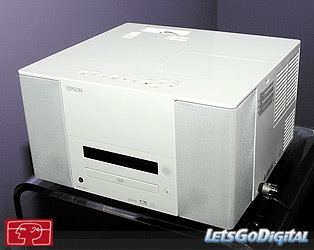 The Epson EMP-TDWD1 1,299 Euro you can get the Epson EMP-TDWD1 in September of 2005.